Hyundai Auto Canada Corp. wants to make what is perhaps a person’s second biggest purchase in life much easier across Canada. The car company is piloting its existing Hyundai Express Shopping platform – which launched last June and has been accessible through the company’s corporate website – with 10 per cent of its dealership network across Canada. The platform, complete with a trade-in appraisal and credit application, will be rolled out nationally by year’s end to dealerships who wish to opt-in, Hyundai told IT World Canada. The company says it is still determining which dealerships express shopping will pilot the platform. Those local dealers and their websites are becoming an increasingly important source of information for customers who want to know exactly what’s available nearby, says Hamilton. It only made sense to deliver the express shopping platform to the local level through a personalized URL, which gives local dealers access to a locked off version of the site only they can access. “The local versions of the module will work the same way, but it will be branded to that dealer,” explains Hamilton. 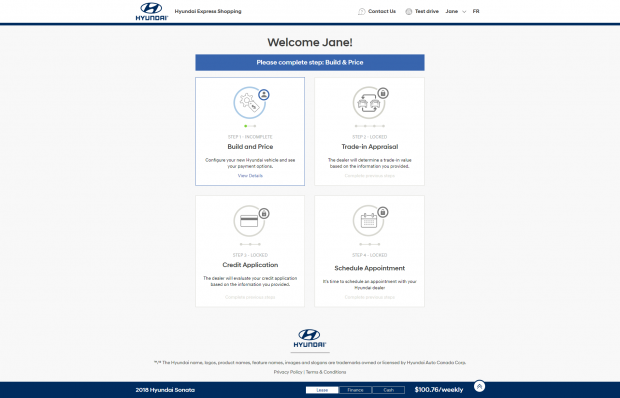 Using the existing platform, currently accessible via Hyundai Auto Canada’s corporate website, customers can build-and-price vehicles, request a trade-in appraisal from their local Hyundai dealership, apply for credit approval for financing or leasing, and schedule an appointment at the dealership of their choosing. Hyundai Express Shopping converted nearly 2.4 times more web leads to actual sales compared to its corporate website between the launch of the express shopping module last June and January 2018, according to data provided by Hyundai Canada. In addition, of those people who submitted an online credit application form on Hyundai Express Shopping, 35 per cent of them ended up purchasing the vehicle, and of the people who booked an appointment through the platform, 31 per cent actually went in. While some of the nuances around what steps can be completed online and what can’t differ from province to province, Hamilton says that, in broad terms, the only reason a customer will have to enter a local dealership – in addition to signing the dotted line, which is a legal requirement – is to test drive the vehicle they’ve chosen. “The principle is when the customer gets there, the dealership knows what car they’re interested in, the test drive is arranged, the paperwork is done and the test drive becomes the affirmation of the customer’s online buying process and choice. That’s the vision,” says Hamilton. He adds Hyundai is also experimenting with an online tool that will give customers the opportunity to essentially negotiate and finalize the price of the vehicle through express shopping. It also recently invested in a new suite of database tools and analytics capabilities. Hamilton says they’re “about to be turned on” and will allow the Hyundai to know how long customers are spending on certain parts of the express shopping platform, how they’re building pricing and what colours they’re choosing. “By that token, we can start implementing that kind of data to make better business decisions in other areas of the business,” says Hamilton. 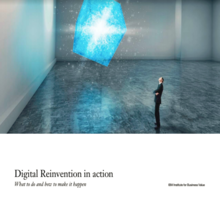 “It’s one part of an infrastructure that we’ve put into place to make sure we do better in the digital space.